There are threads for Scotch and Gin, but not for Cognac. I own two older bottles which will be emptied in the next months. I do love this stuff but cannhope to find these again. I am at a loss at which currently available Cognac to buy. I'm not a Cognac drinker.....But I do enjoy Armagnac, a particular type of French brandy. Have you tried it? I tried Armagnac occasionally and liked it. Would you like to recommend currently available Armagnac? (01-16-2019, 12:30 PM)apogee. Wrote: I tried Armagnac occasionally and liked it. Saint Vivant is my choice. It would seem that Lhe'raud is still making and selling cognac. Definitely pricey but you can find vintages from 1972 to 1983. They also have less pricey offerings. Just search Lheraud Cognac. If you are looking to venture outside of that brand, I tend to like Hine Cognac VSOP. And it won't break the bank. 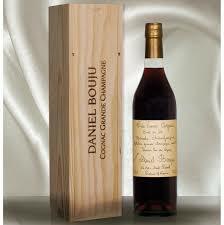 I’m mainly a Calvados drinker, but I do like a good Cognac especially Remi Martin VSOP. Very interesting is also Godet & Pearadise (pear cognac) and I finished Godet Antarctica - first colourless cognac. Antarctica is more interesting than really tasty thing IMHO.